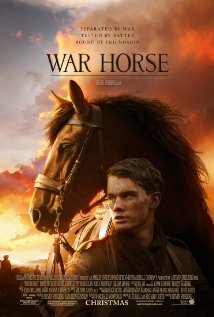 War Horse, Stephen Spielberg's film based on Michael Morpugo's novel, comes out Christmas Day. The story of the love between a horse and its master, the tale is one of love's power and the meaning of home. When Joey, a bay-red foal is sold by his young master, Albert, to accompany Captain Nichols' as his personal horse on the front lines, boy and horse are devastated. Nichols promises he'll look after him and bring him home. Once on the front lines, Joey becomes known and loved by the troops for his bravery. Still, the horse's heart aches for Albert, as Albert's aches for his horse. Albert joins the army, promising he will find his beloved horse. The film stars Jeremy Irvine as Albert. A relative unknown to American audiences, since being cast in War Horse, he's wrapped Now Is Good with Dakota Fanning, is currently filming as Pip in Great Expectations and set to star alongside Colin Firth and Rachel Weisz in the film version of the Eric Lomax book, The Railway Man. I imagine he'll be a household name soon enough! For War Horse he's joined by Emily Watson as Rose, Tom Hiddleston as Captain Nichols, Joey's rider during the war, and Benedict Cumberbatch as Major Stewart, Nichols' best friend. I've just seen Cumberbatch in Tinker, Tailor, Soldier, Spy in which he did some outstanding work.